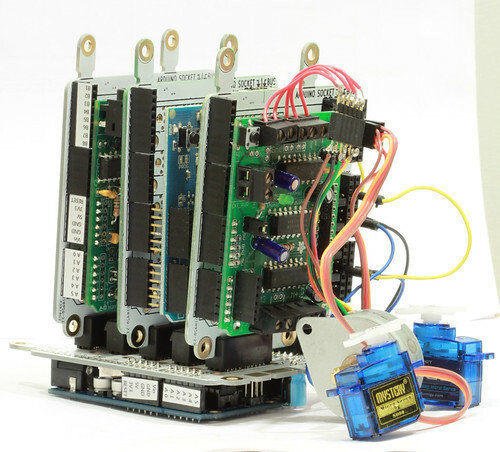 The mama shield is a kind of “motherboard”that lets you connect multiple shields to an Arduino. Designed for high-speed prototyping, Mama shield has a 5 slots. Each slot has a 36 pins. The slots contain all of the Arduino pins plus 8 shared bus pins. The bus pins allow cards to communicate between each other. The slots are placed at a pitch equal to a 0.5 inch standoff plus the thickness of a 0.062 inch circuit board. This way you can fasten all the circuit boards together into a brick of circuit boards. 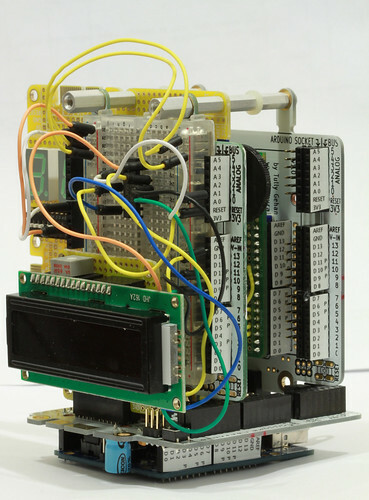 The Mama Shield also has a switchboard so you can easily reconfigure the pin mapping. The switchboard can be used much like an old-style switchboard was used by a telephone operator to connect a call. There is also a row of jumper pins with the jumpers in case you want to keep everything the same.